The Scarlett 18i8 extends the popular Scarlett range of audio interfaces from Focusrite each of which offers a series of high quality inputs and outputs for almost every recording requirement. 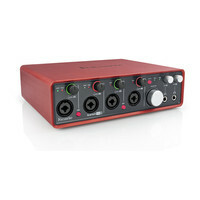 The Scarlett 18i8 18-in / 8-out USB 2.0 audio interface is designed for producers / recording artists / bands who require the ability to record a significant number of sources at the same time.Includes: Softube and Focusrite Red plug-ins. This entry was posted in Focusrite and tagged Recording-and-Computers. Bookmark the permalink.